Our Green peppers from top vendors like Moody Dunbar, Conagra Foods, and Megamex round out our mix of restaurant supply foods for cooking. 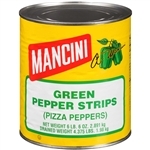 We carry the best whole and diced green peppers for mexican fajitas and healthy vegetable dishes. Green pepper has provitamin A (beta-carotene and cryptoxanthin,which the body converts to vitamin A as needed), potassium, folate, vitamin B, vitamin E, and antioxidants to fight cancer. 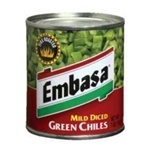 Megamex Embasa Chile Diced Green Peppers - 27 Oz. 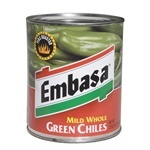 Megamex Embasa Whole Green Peppers - 27 Oz. Green Peppers for your healthy restaurant cooking vegetable dishes. Expecting mothers should eat green peppers for the folate.